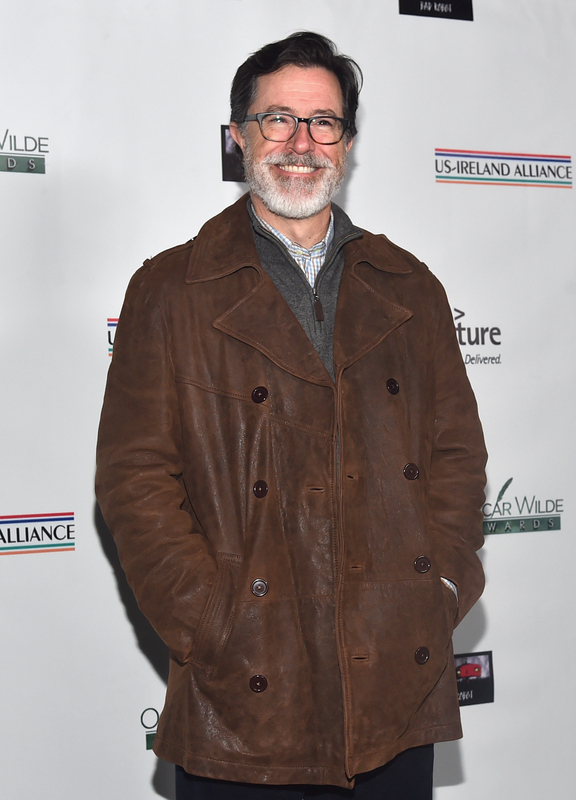 How Long Will Stephen Colbert Keep His Beard Around? It Will Visit 'Mindy' But Will It See The 'Late Show'? Could there be anything more exciting than Stephen Colbert guest starring on The Mindy Project? Although it seems impossible to up the ante with that combination of gloriousness, Colbert's gray beard on The Mindy Project episode makes it possibly the best thing to happen in 2015 so far. The woman behind The Mindy Project, Mindy Kaling, posted a photo to Instagram of Colbert on set with her on Feb. 20. Colbert will star as Father Michael O'Donnell on the March 10 episode of The Mindy Project and I can say in full faith as a person who was raised Catholic that Father Michael would have had me all in a tizzy during mass with a beard like that. "I have not allowed this to happen to my face since college because I’ve been working professionally pretty constantly since then ... I have like nine months where nobody has to see me so I said, 'I wonder what I look like?'" Well, Colbert. You look amazing. Since he wrapped up The Colbert Report in 2014 and won't take over the Late Show until Sept. 8, his statement makes it seem that he will get rid of the beard before hosting the CBS show. And he told E! at the Oscar Wilde Awards that "My wife has gotten used to it now. At first she wasn't sure who this man in bed with her was ... She likes it OK, so I guess I'm OK with it." As for his appearance on The Mindy Project, you may be mourning the loss of Adam Pally as Peter Prentice, but the show has been killing it with guest stars this season. Kaling has been compensating for the Pally with amazing guests like Vanessa Williams, Rob McElhenney, Kris Jenner, and Cristin Milioti and Laverne Cox (who will both appear on the March 17 episode with returning guest star Julia Stiles). And now, we get Colbert as a Catholic priest. My Mindy-loving life is complete. When Colbert spoke at the Oscar Wilde Awards he revealed that he actually had the beard the entire time The Colbert Report was on. "My show ended two months ago and technically, for the record, I’m not in character. This is me. It turns out the real Stephen Colbert had a beard the whole time, I was just so deeply in character for 10 years you didn’t notice. That’s how good of an actor I am." Even though his comments at the Oscar Wilde Awards point to him eventually getting rid of the beard before Sept., Colbert made the excellent point to The Daily Beast that "In a pre-industrial stainless steel razor’s edge society, this is what I would have looked like all the time." Preach, Colbert! (Err, literally preach on The Mindy Project on March 10.) And if he does get rid of the beard, at least it will be well-documented thanks to Mindy Kaling. Ah, I owe that woman so much.